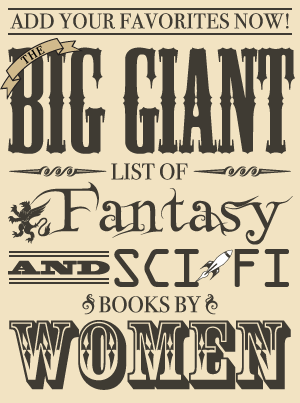 April is once again going to be Women in SF&F Month on Fantasy Cafe! Three years in, I can now officially say it’s an annual event and the most fun thing I do on the site (even if it’s also the most work)! Throughout April I set aside my normal reviews and coverage of book news to turn over the mic to some of the many women doing wonderful work in the speculative fiction genres. As with the last two years, I am quite happy if they want to talk about issues related to being a female author or fan, but my goal is simply to gather a bunch of women invested in the genre in one place at one time and showcase the work they are doing. Contributions have ranged from women discussing their own work and process to what they find best about the works of other women to issues of representation and equity in fandom. In the last two years, over 100 women have been either featured as guests or mentioned as inspirations to the guests who have written posts (with links to many more). There will be much more to come as we get closer to April, so stay tuned!